The group, Running for Shelter, is taking part in the 200-mile Hood to Coast Relay in August with the goal of raising $100,000 for National Church Residences’ (NCR’s) hospice program, which would be a group record, says team captain Paul Cummings, senior vice president and director of originations and capital markets at the National Affordable Housing Trust (NAHT). Close to $70,000 has been committed to date. 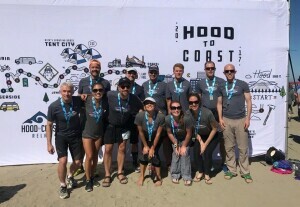 The 2017 Running for Shelter team at the finish line. The funds will aid in the creation of two in-patient rooms at two of NCR’s communities as well as the expansion of its Memorable Moments programming. In its 20 years, Running for Shelter has logged thousands of miles and raised over $800,000 for different nonprofit affordable housing organizations. “It’s a unique way to fundraise for affordable housing,” says race veteran Cummings, adding that the event is also very collegial, bringing together people from different areas of the industry. Mark McDaniel, CEO of Cinnaire, ran on the team in 1997 and 1998 and calls it one of the top activities he has participated in his life. He recalls getting to know his teammates during the course of the event. The challenging Oregon race, dubbed “The Mother of All Relays,” consists of 36 legs and takes about 24 hours to complete. Teams have a maximum of 12 runners and must run in rotating legs. Over the past 20-plus years, the team has run through scorching temperatures and torrential downpours but always crossed the finish line. A new team takes the course this year. This year’s team features several people well known in the affordable housing business. In addition to Cummings, the team includes Michelle Norris and Matt Rule of NCR, Jim Bowman, formerly of NAHT, Elizabeth Flannery of Community Housing Development Corp., Lisalynne Quinn of Red Capital Group, Anne Fennema of National Equity Fund (NEF), and Dan Mendelson of Chesapeake Community Advisors. The affordable housing connection isn’t limited to the road warriors. Running for Shelter has been supported by a number of different affordable housing corporate sponsors. Over the years, they’ve included Cinnaire, Enterprise, NEF, Ohio Capital Corporation for Housing, Sugar Creek Capital, Gallagher Evelius & Jones, Kantor Taylor, Bocarsly Emden, Holland & Knight, and the Kresge Foundation. For more information, visit www.200MilesForHospice.com.